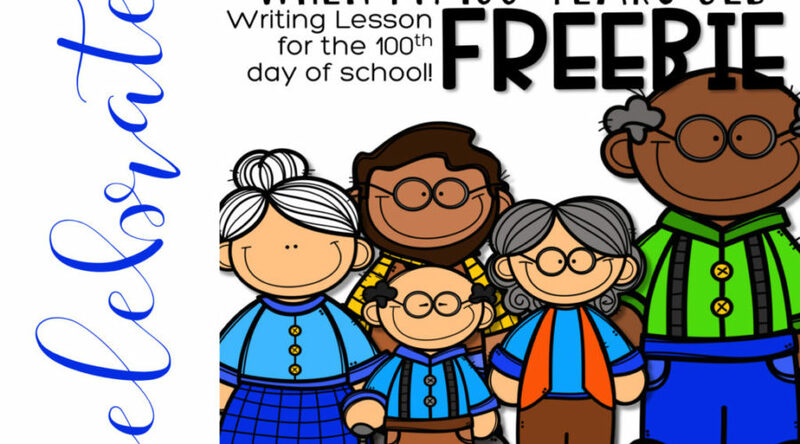 I have a FREE 100th Day of School activity for you. Our 100th day of school is coming up very soon. We don’t always have a ton of time for many activities on that day, but I always squeeze this one in. I do a very simple and fun writing plan with every writing assignment we do. I am OBSESSED with using simplistic, predictable and routine writing plans. This one is simple, great for all primary grades. It absolutely grows with the student and curriculum and standards demands. I included detailed writing lesson/plan directions with this little freebie. If you are already using Engaging Writing or any of my other writing resources, this will fall right in line with your writing instruction. If you aren’t, it is easy to follow and you will LOVE the how effective it is! While the kids are working on their writing, I take their picture using this “Aging Booth” app from the App Store. I really like this app because it is QUICK to use and does a good job. I print out their “old” pictures and they glue them on their stationary. It’s hilarious and cute. You can grab this FREEBIE in my store. If you do something for Grandparent’s Day, this version is perfect! Are you / have you added anything new to your 100th day routine? Thank you for the shout out! I love your activity, too! Thank you. I really love that guy… I'll be a dead guy. hahahha Makes me smile every time I look at it. I love this activity! Too cute! Thank you for telling about Step-Up-To-Writing. That is an area that I really need to work on, but I haven't found anything that I like. I'm off to check it out! I've given you a shout out on my post this morning…come by and check it out! Love this idea! I was not familiar with Step-Up-To-Writing! Thanks for sharing! Would love to learn more! I'm new to blogging and love what I see! Come see me if you get a chance! Thanks Laura. I will try and post more on SUTW. Yay! Happy weekend to you, too. We have Step Up, but I rarely use it, because we have had no training with it. I think I may have to go pull it out and look through it again. Laurie…if you do nothing else from Step Up…do the T-chart. It will simplify your life! There is so much stuff that comes with SUtW that it can be overwhelming. Just found your blog and I'm your newest follower. Cute stuff! I tagged you too! Come on by my blog and check it out! 🙂 Have a great week!! !